Turkey's Mediterranean climate, with mild winters and hot and arid summers, gave us the opportunity to design the park by exploring the simplicity of the surroundings as a notion for designing. With the challenge for a proposal that would provide all the necessary functions and create a park that focuses on environmental and design education, this proposal stands as a binary between experience and function, as a binary between natural and manmade landscape. The main idea is to perceive the whole territory as an indivisible whole, which, in addition to its natural beauty and importance, has the ambition to host the memories of its unwritten cultural and social history. The complex layers of the past, the needs of the citizens as users, the needs of the visitors as future users, and the unique formation of the landscape consist the main elements that help us transform this (almost) abandoned site into a new sustainable and ecological site. The landscape is understood as a unique entity, a place of experience, where nature and the landscape are ever-present. Space is inscribed as the subtle interpretation of local culture in the form of a seemingly un-designed landscape, that unobtrusively engages the visitor through a plethora of stimuli that try to evoke his or hers memories. The characteristics of the landscape are retained and are transformed in an ecosystem that functions, as ecological thinking pattern across tall scales of the site. An organic model of open - endedness, flexibility, resilience and adaptation are chosen instead of a mechanistic model of stability and control. The ecosystem used in the project is self- organizing and to some extent, unpredictable. Living systems are thus, characterized by uncertainty and dynamism. All ecosystems are constantly evolving, often in ways that are discontinuous and uneven. While some ecosystem states are perceived by us to be stable, this is not stability, in the strict sense, but rather our human, time - limited perception of stasis. The work of Canadian ecologist C.S. "Buzz" Holling pioneered this concept in terms of resource management. He referred to ecosystems as "shifting steady - state mosaics", implying that stability is patchy and scale-dependent, and is neither a constant nor a phenomenon that defines a whole system at any one point in time or space. The construction techniques to be used in all the new buildings aim to minimize the alterations to the environment and terrain. Their carbon footprint is kept low and measures are taken to ensure a possible certification for the entire project, concerning recyclability of materials, renewable energy resources, minimum waste process etc. 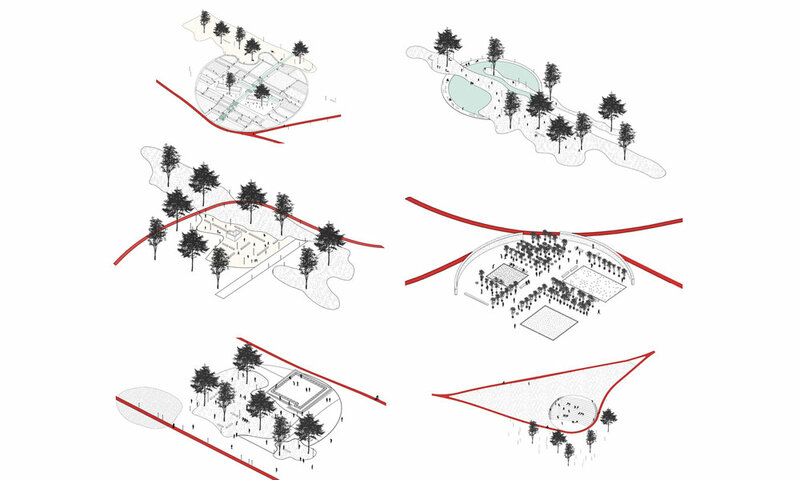 The proposal aims to maintain the balance between the users’ interactions and the natural landscape, by controlling all the operations, constructions, paths and uses but also by trying to evoke visitors’ environmental awareness. Space is designed to contain more than a single function and this is implied in all design scales. 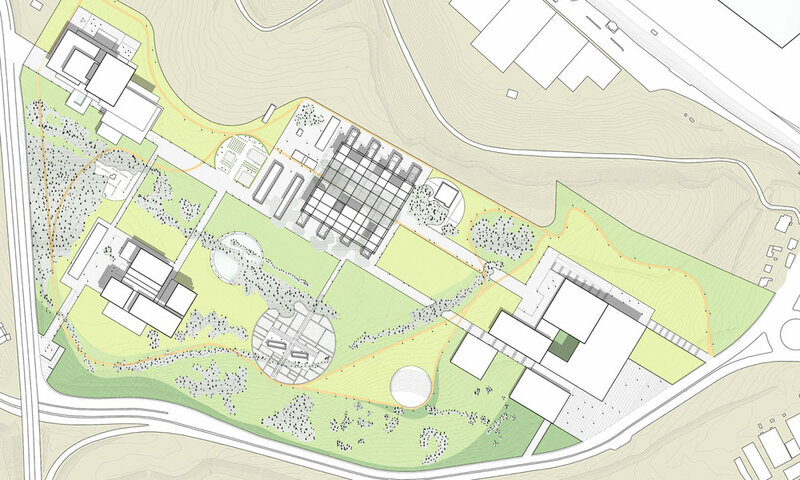 The first attempt was to involve the broader area where the project is situated. As space is conceived as an infinite movement within the boundaries of the site, we found that it would be contradictory to our initial approach not to relate it to the nearby settlements. Thus, the proposal is organized first at a regional level. The main entrances to the site correspond to a continuity of the urban fabric of the city creating a continuous flow of movement from the city and harbor, to the park and vice – versa. The building program is scattered in order to induce the sense of a void in space, forming islands of activities and services, in a way so as not to obstruct the paths and the chance for the visitor to move freely in the landscape. All of the structures are designed in such a way so as not to obstruct the view of the sea and the city. 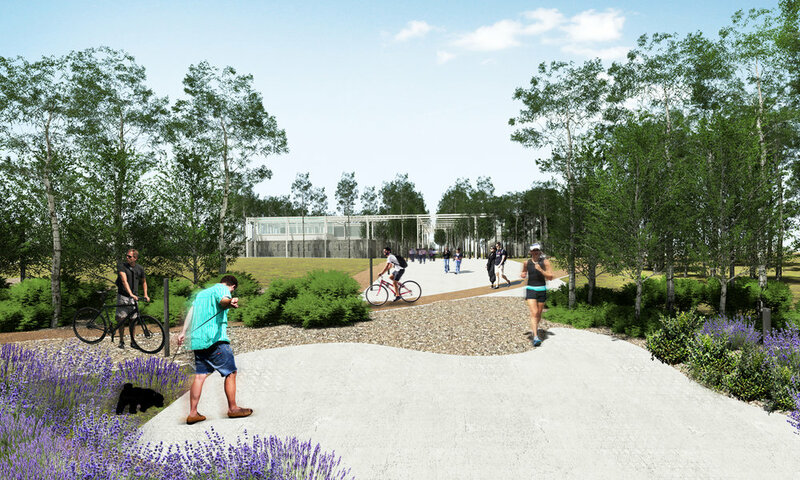 The landscape of the site is defined by a major axis of circulation of northwest and southeast direction connects all the major buildings and uses of the park, creating a discernible and clear new topography. The axis connects the retail center, located at the southeast part of the site, with the 5* hotel situated in the northwest part. In between, one can find the Design Institute and the 4* hotel, while passing through various smaller meeting points that give different character to the landscape formations. The constructed landscapes feature several open air plazas that create distinctive momentum points. The square of water is defined by a great pond and refers to the Renaissance gardens, seeking refuge from time and mortality. The open-air theater can host different events, the orangerie garden is a reference to French landscape design, and the Islamic garden, a place of rest and reflection, according to Qur’an. Each garden imposes its unique character and the visitor is guided to a multi-experiential path while discovering the site, in a random walk on foot, by bicycle or jogging. The retail building is situated at the entrance of the plot at the Atatürk Blv round-about, as it is the most extrovert function of the complex. A large open entrance invites visitors and users to enter the complex and either head to the Shopping centre or go towards the rest of the buildings and the park. The retail building developed in three levels, is adapted to the slope of the site and is characterized by the use of open space as a complementary to the indoor shopping experience. The Design Institute is within the area of the listed historical ruins. The ruins are incorporated in the proposed design as a strong element of the cultural identity of the place, and become part of a network of spaces that work together. The main uses of the Design Institute are situated in a new elevated building that sits above the historical buildings, while creating atriums within the historical structures that define the outdoor spaces. The canopy, having one floor for programmatic uses of the Design Institute, serves as a connecting element between the old and the new, between the open and the closed spaces. The horizontality of the canopy creates a continuity on a higher level with the horizontality of the landscape and a contrast to the stiff vertical preexisting buildings. The five star (5*) hotel complex is situated at the most privileges point of the plot, in terms of privacy and view, while the four star (4*) hotel complex is found at the south-west part of the plot, in proximity to a large green area. Both hotels are characterized by a sharp design that emphasizes on the horizontality of the built elements united with the environment. The architectural language proposed uses simple and clear lines that induce a sense of calm and tranquility, while using contemporary and elegant materials. The buildings through their straight lines and minimal design come in contrast with the curvy and "wild' sense of nature, either in its natural or manmade form. Overlooking the Marmara Sea and the whole city of Balıkesir, the competition site of approximately 26 ha, is within the walking distance of the city centre and the port. The object of the competition is the redesign and the reevaluation of this area which is going to be used as a large scale, open and public space near the centre of Bandırma. What can be identified as a major issue in the area of Bandirma is probably the lack of public spaces, either in the urban fabric or natural area. The challenge of the project, as our team perceives it, is to provide Bandirma with a new open space, a designed park, capable of giving birth to new conditions and meanings of living within the city, by producing a positive environment for the creation of a multitude of uses that shall coexist. What the district of Bandirma and the city of Balikesir seem to need, is not only a well designed public park together with touristic and cultural infrastructure, but also a strategic vision for its development, a strategy which will incorporate citizens, new functions, an extrovert city profile and 24 hour uses altogether under a sustainable project. Keeping the above in mind, through our project with the title CONSTRUCTED LANDSCAPES we attempt to give a series of incentives for the local population as well as for the visitors that will be visiting the area, to feel Bandirma Park as the continuity of their city and as a place to relax, to work, to visit the Design Institute and to live a holistic experience combining urban amenities and natural environment. CONSTRUCTED LANDSCAPES project aspires to generate a new identity for the city of Balıkesir that its citizens would be proud to assimilate. Hence, provided a right infrastructure, people could hopefully appreciate the value of public and green space, of social and cultural densification as well as the value of walking and running, by using the means given by the park. The project of the intervention aspires to incorporate good design into a total socioeconomic approach for the development of the city. We believe that the intervention goes even beyond the notion οf the “project”: it is better described as a dynamic “process”. It is thus more important to define the joining forces that will be part of this strategy and will be called to collaborate on the intervention, than to propose a final plan. The commercial and touristic sector, represented by the retail and the hotels, will work in synergy with the educational, cultural and sport aspect that is represented by the Design Institute and the park : the gains are mutual when each activity is implemented effectively. The effects of an intervention of such a scale are expected to be also long term and to influence projects and behavior patterns of the whole center of the city. This means that both stakeholders and shareholders are to be considered and satisfied. Moreover, the intervention will engage both public and private sector and henceforth, healthy synergies are expected to be produced. In a broader scale, Balıkesir will be redefined as a contemporary and competitive city that will act as a cultural and economic motor for the whole region.